Oh, the salad. My absolute favorite thing to make. It’s so easy and versatile. Salads are even visually appealing! Making a salad doesn’t require any pots and pans, ovens, microwaves, or slow cookers. It’s the ultimate minimalist meal. I love salads so much that I eat one daily for lunch and sometimes I throw one in as a side for dinner. 2. The nutrients. This is your main benefit. Just from spring mix, you can get all your vitamin A and significant helping of vitamin C, iron, and fiber. This meal is your body’s fuel. 3. You’ll feel full. 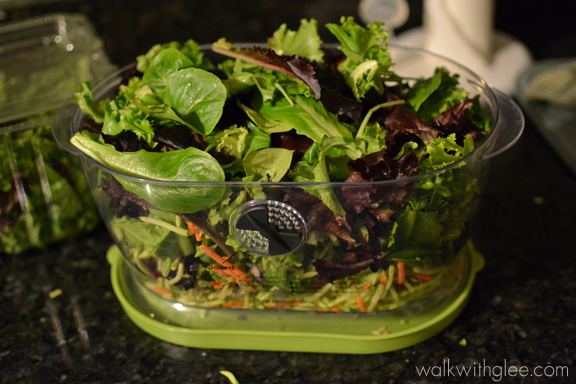 Salads may not seem like a lot, but if you make a big salad and manage to eat it all, it can really fill you up. Now – that statement is just anecdotal evidence. If you are used to eating a LOT of calories, then it’s possible that your body will need to adjust and you still may need to eat a snack later on. In general, if you eat a big enough salad with lots of goodies in it, you will probably not feel the need to eat much else. 4. 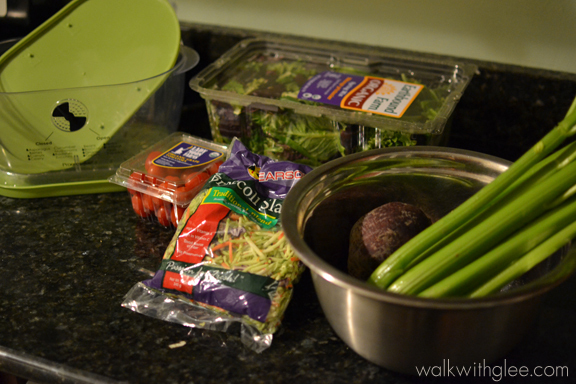 After your cut-and-prepare day, you will always have a supply of ready-to-eat fresh veggies on hand. Not only is this your lunch, but you can even use the same ingredients in your dinner – throw in your washed and cut celery into soup, steam some of those bell peppers you have ready to go, etc. 5. 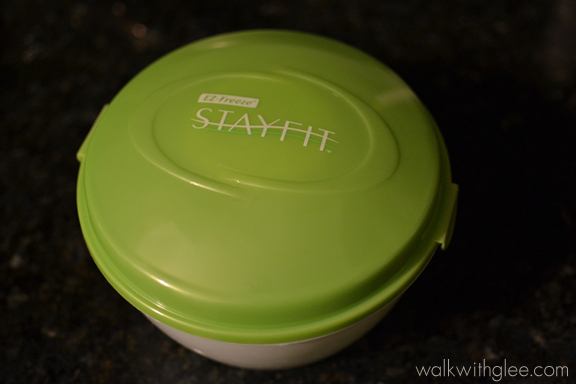 It takes very little time to throw into this handy-dandy salad container. I’ve brought this to work every single day for 2 years. 6. It simplifies your shopping. 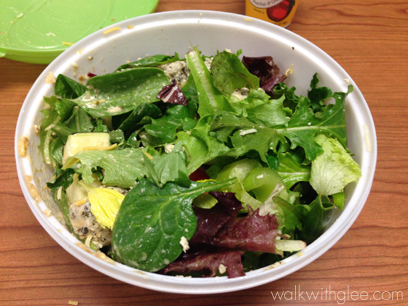 Ask yourself: what do I want to put in my daily salad? 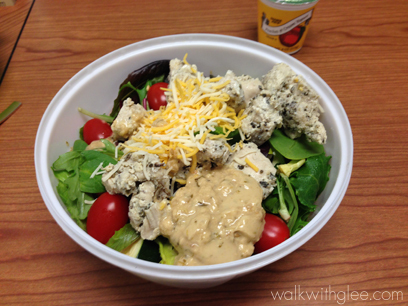 The SBR is exactly what it sounds like – a salad bar in your refrigerator. 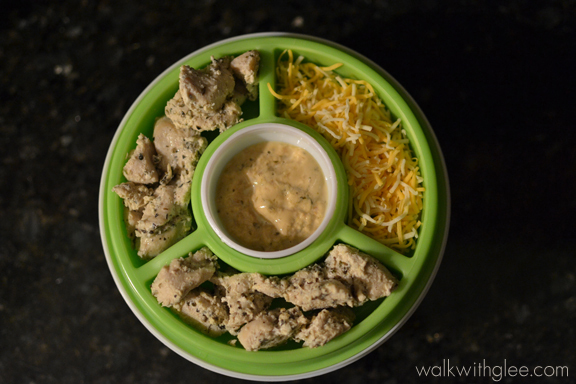 It will make packing lunch incredibly simple, and if you are too tired to cook dinner, your dinner will still take less than 5 minutes to make if you use this method. The concept is laughably simple: after you purchase your ingredients, wash and cut them all up and put them in containers. Other than spring greens, I typically always have celery, beets, brussel sprouts, and some kind of assorted pre-cut vegetable in my salad. I also have nuts and in my pantry and some type of protein in my fridge – deli meat, hard boiled eggs, or cooked chicken breast are my go-to’s, but beans are also a great idea. You can even add some cooked quinoa! 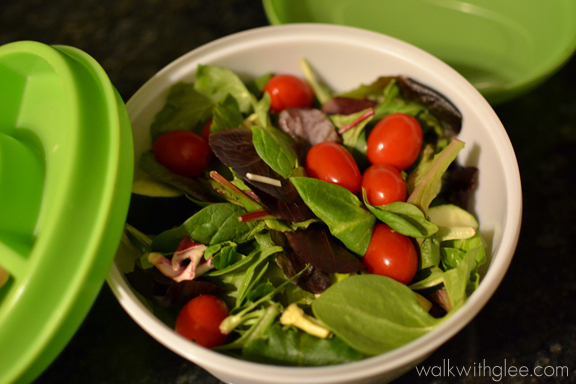 Now before you think that it’s silly for me to be blogging about washing and cutting salad ingredients, we should recognize that convenience is a huge factor when deciding what to eat. That’s why it’s so easy to for us to fall into a junk food habit – it’s too easy to pop open a bag of chips or unwrap a bar of chocolate. It’s not convenient to wash fresh vegetables every time you’re hungry. The SBR is simply a way of circumventing that. Now that we’re on board – here we go! 1. 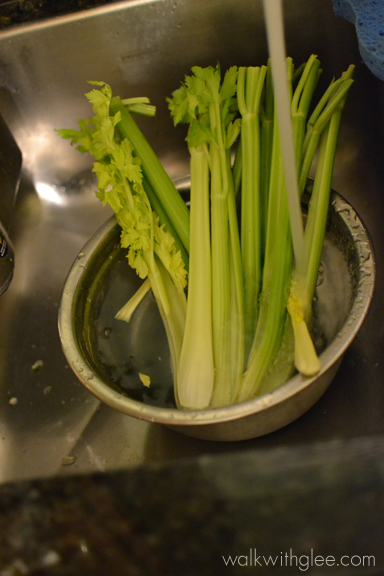 Start by washing all your vegetables. Get rid of all the yucky dirt and grime! 2. Next, get a big cutting board and start chopping. Keep the leaves on your celery! There are lots of goodies in them. 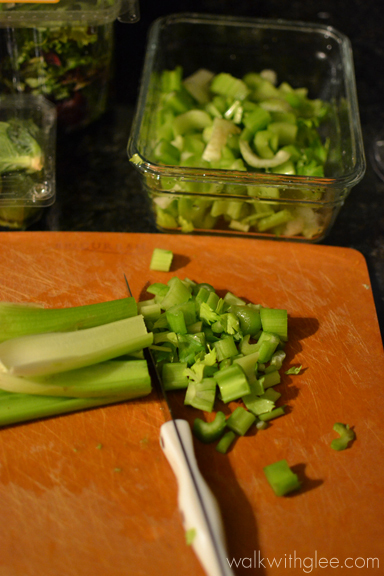 Select celery that is a darker green because it has a higher concentration of nutrients. 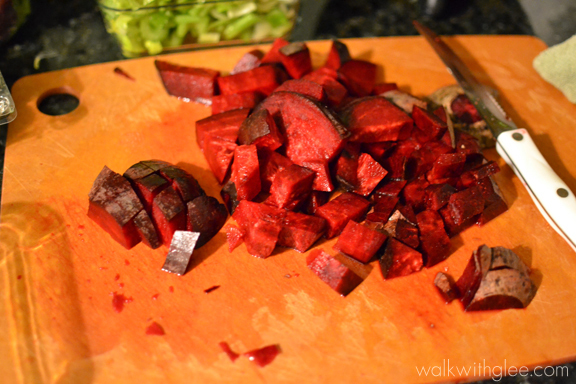 Look at how beautifully red the beets are! You don’t typically see raw beets in salads, but they really are a treat if you like the taste. Beets are sweet and earthy. You might find that they stain your cutting board (I have an epicurean cutting board which can be purchased here; these are dishwasher-safe) and your hands. Some people may find them a bit too bitter raw, but you can roast them or soak them in vinegar. I eat them with the skin on. 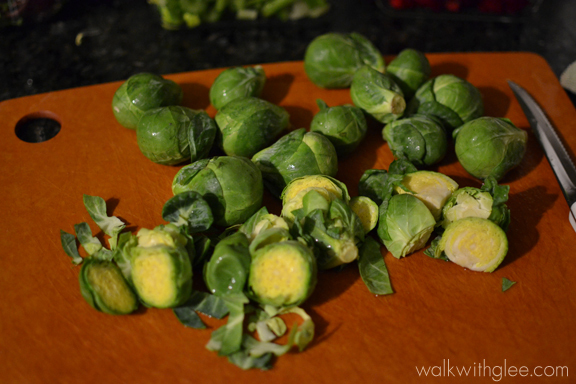 I find that brussels sprouts are easier to eat when they’re quartered. They’re like cute little lettuce heads. 3. 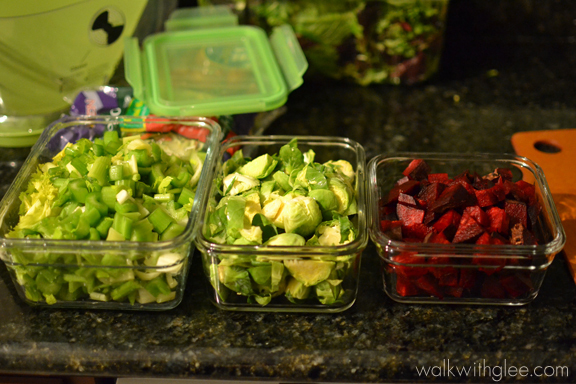 As you finish chopping each vegetable, put them into containers. Different vegetables require different methods of storage! I find that my cut celery, beets, and brussels sprouts do very well in airtight glass containers and store for at least a week. 4. 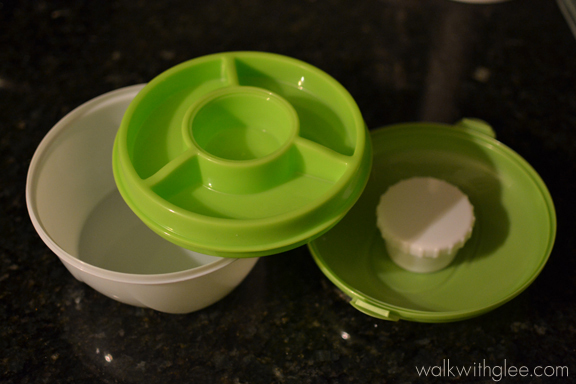 Your salad greens can be stored in the original container. I buy mine prewashed. If you want to mix them with some other chopped vegetables (make sure everything is dry or your entire mix will spoil really fast), try using this handy-dandy lettuce keeper (with the vents open). Leafy greens need to breathe. 5. When you are done with all your cutting and washing, take a step back to admire your work! A week of lunch, all ready to go. 1. Your vegetables will spoil faster and some of the nutrients might be lost in the process of cutting and washing in advance. All the more reason to eat more of them every day! If you are concerned with your vegetables spoiling too quickly, I recommend throwing some bluapples in your fridge. 2. Due to #1 above, you will have to run to the grocery store more often to replenish your stock. 3. If you are not used to eating a lot of vegetables, you might become a bit bloated and gassy after finishing your salad. 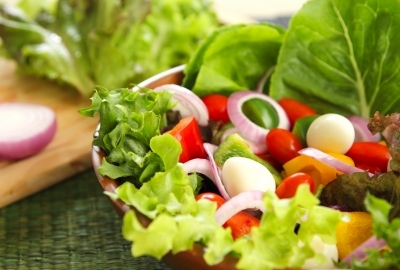 Over time, the bloating will lessen, but to avoid discomfort, introduce hearty salads into your diet gradually. 4. Your jaws might get tired from all that chewing. 5. You will probably need some floss after finishing your salad. 6. Your mind may become clearer. 7. The overwhelming concentration of nutrients may make you bounce around with glee. In the end, when you’re ready to pack up your lunch for the day ahead, you simply whip out your prepared ingredients and assemble! Typically I would not recommend shredded cheese as one of your toppings (high saturated fat) but in moderation it’s okay. Still better to go with some nuts or beans. At work, take the top off, and add everything from the upper tray to the bowl. Then replace the top and shake! And now you have a fresh homemade salad with all the ingredients that you want to eat. If you try the SBR, I would LOVE to hear about your experience and any suggestions for ingredients. Happy Salad Making! I love your salad enthusiasm! 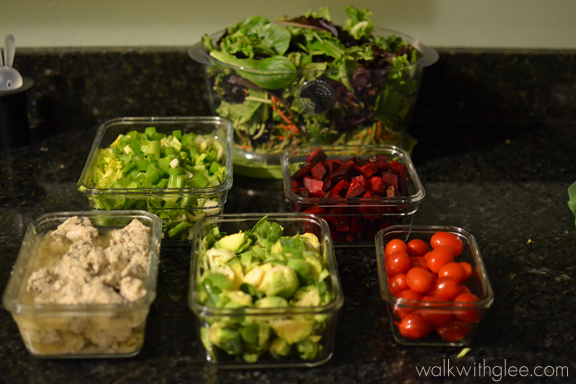 I’ve always like salads so I’d love to incorporate more into my meals. 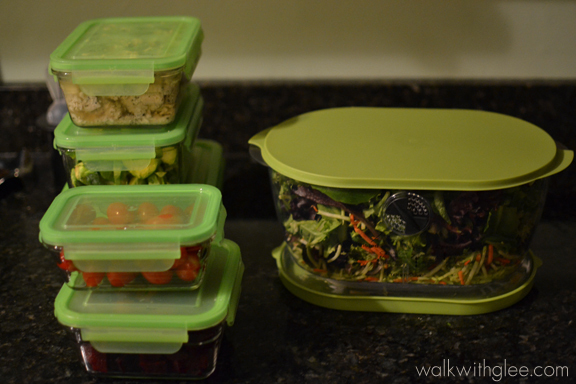 Plus being more organized with the vegetables is always helpful! I love the idea of using beets. I’ve never bought fresh beets since I’ve never taken the time to figure out how to handle/cook them, but I’ll have to pick some up since I do enjoy myself some beets!